Is it a GLITCH? OR is it LinkedIn? We’ve all experienced it (some us in front of a room filled with hundreds of people)… We’re tooling around in LinkedIn, go to do something and WHAM-MO! What we’re looking for is no longer there OR you click on it and it doesn’t work OR you type in an invitation to connect/group post/comment/etc., your text disappears and nothing happens! We have ALL experienced this frustration at some point. Since the platform change, I know there’s been a lot more frustration than normal. As one of the original 10 Official Volunteer LinkedIn Forum Experts (now 14), I’ve been on the front lines of that frustration. I’ve been sharing my troubleshooting steps with many in the Help Forum on an individual basis, so I thought I’d share them with everyone. My hope is that following these steps can help alleviate some of your frustration. One of the best things that has come from participating in this program is seeing with my own eyes that LinkedIn is listening to the feedback it is being given – and they want you to give them your feedback (you’ll find a pop up on every page of the Help Center) There are lots of big and small changes happening every day that are IMPROVING the platform. (I really wish they would publish an ongoing list so that it would help us find them – once they’ve come out of beta.) I have been vocal in my displeasure over the changes, but I can positively say, that I’m liking the new format better every day. The downside of this massive coding activity (make us all fall back in love with LinkedIn), is that you’re going to run into glitches. There’s just no way around it. When you have a program this LARGE and LIVING (could you imagine if they took it offline to fix things? ), then there are are going to be bugs no matter how well the new code was tested. You never really know how the code will run until it’s tied into the entire program. So, how do you troubleshoot to see if it’s a GLITCH, a bigger problem or intentional change? Step #1: Close the tabs in your browser running LinkedIn and clear your cache. Step #2: Try to duplicate the problem in a different browser. First, be certain that you’re using one of LinkedIn’s supported browsers. Here’s a great Help Center article that covers what browsers are supported and some known issues with the browsers: https://www.linkedin.com/help/linkedin/answer/4135 Open a second supported browser and see if the same thing happens in that version of LinkedIn (generally speaking, it’s always a good thing to have 2 to 3 different browsers available on your computer). Each browser has it’s own eccentricities that requires some of the coding to be customized to them. You could be trying to use a feature in the middle of a coding change and they just haven’t customized it to your preferred browser yet. This type of glitch usually doesn’t last too long, but I have had to go a week or more opening up a second browser to do a specific task that wasn’t working in my preferred browser. If it doesn’t clear up after a day, then go to the next steps. While it’s not always 100% up to date, they do tend to list the problems that are bigger and that they are getting a lot of tickets on. Not every little known issue is listed, so if yours isn’t, then it’s time to move to Step #4. Step #4: Submit a Ticket to the Help Center. This is the last option for any type of problem you have on LinkedIn. If you’re having a technical or account related problem, do not bother posting a question in the Help Forum. The Help Forum is not monitored by tech or customer support. It is a forum for LinkedIn members to help each other. To Submit a Ticket, look for the “Contact Us” link in the footer of the Help Center. The Ticket process will funnel your problem to the best people to help you, so please review all of the different options to categorize your problem properly. This will prevent delays in having to get re-routed to the right people. Try to take screenshots or screen videos to be able to show them the problem. A picture is truly worth a thousand words in helping them understand what the problem is that you’re having. In your description, include the details on any troubleshooting that you’ve already done so that they can skip over that if it isn’t necessary and get to a more advanced solution. So, that’s what you should do if something seems wrong. Those first three steps can be done in minutes and they will likely fix your problem – or at least know that it’s a temporary problem – most of the time. Don’t be afraid to submit a ticket too early. I’ve submitted tickets and had the glitch get fixed before I get a response. LinkedIn isn’t perfect. The ticket process can take longer than you want and you don’t always get a clear response. In case you’re wondering, there is no phone support – for anyone – not even premium. I have found that the success that you have working with support is greatly dependent on the information you provide. Details, Details, Details! Oh, and Pictures, Pictures, Pictures! The more you can troubleshoot your issues on your own, the less likely you’re going to have to turn to tech support. 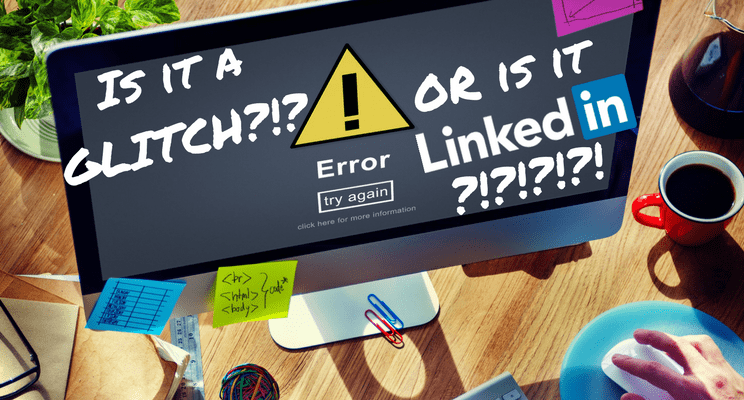 So, I hope this helps decrease your frustration the next time you don’t see what you expect or have happen what you expect when you’re working on LinkedIn! Crystal Thies has been known as the LinkedIn Ninja since founding her company, Crystal Clear Buzz, in 2009. Although well versed and experienced in all social media, Crystal specializes in the utilization of LinkedIn for sales and business development. As a past financial planner, Crystal is one of the few social media strategists with expertise to work with those regulated by FINRA, the SEC, and IIROC. She is the co-author of “The Social Media Handbook for Financial Advisors” published by Bloomberg Press.